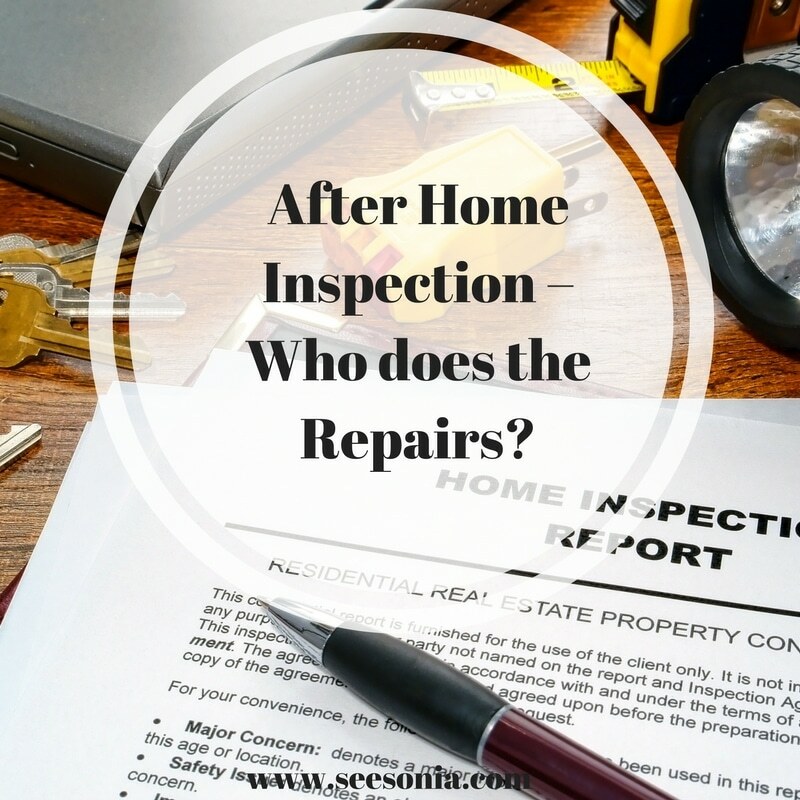 After Home Inspection – Who does the Repairs? I had a client ask me what happens after I do my home inspection. Who is responsible for the repairs? Although this might seem like a very simple question there are many responses. You see it all depends on how the type of home that is being sold such as a foreclosure, short sale or regular sale. If the home is being sold as a foreclosure then this type of home will be SOLD-AS-IS. When a home is sold-as-is then the bank (seller) will not repair any such items that will pop up on the home inspection repair list. It is known that the home is sold as-is which means that the seller will not take any responsibility for the condition or repairs or provide a warranty of any kind. A foreclosure is the process of taking possession of a mortgaged property as a result of the mortgagor’s failure to keep up mortgage payments. Basically if you don’t pay for your mortgage it will be taken away. When you are buying a foreclosure the bank will not allow for any repairs since they are taking a huge loss on the property already so the buyer is responsible for any repairs on the home inspection. The inspection is done for peace of mind even though the bank will not repair anything. This way YOU as the buyer will know whether or not you want to continue with the purchase. If you are buying a short sale then this type of property is also sold-as-is and the seller will not repair anything since in most cases since the owner of the property is already losing the property. According to wikipedia a short sale is a sale of real estate in which the net proceeds from selling the property will fall short of the debts secured by liens against the property. In simplest terms you might be upside on your mortgage in which you as the home owner owe more than what the home is worth. An example of that would be if the mortgage is $300,000 and the property is only worth $150,000 then you would owe the bank $150,000 if you could no longer pay on that mortgage amount. You have the right to do a home inspection on the property however just realize that the owner is already losing the home and might not be able to afford to do the repairs on the home inspection. If you are buying a home as a regular sale then you may ask the seller to do all the repairs that were listed in the home inspection report. Of course, this will also be a negotiation depending on if you are asking for a laundry list of items. Typically if you ask for everything on the home inspection report the seller might get overwhelmed and seem as if you are asking for the whole home to be re-built however it is your right as a buyer to ask for that. 1. You can ask the seller to only repair the big items such as the roof, electrical or plumbing issues. If the seller does not want to fix the big items then maybe try to include less items. 2. You can ask the seller for items that are of safety and or health concerns. Such as mold, significant water damage or missing smoke detectors are typically among the list of things that the buyer is not responsible for and must be taken care of by the seller before the house can be sold. 3. If the both parties cannot agree to anything then the deal will have to be cancelled. Unfortunately with this process both the you as the buyer and the seller would have spent time and money on this deal. You as the buyer would have spent on the home inspection and appraisal plus time looking for a home. The seller would have spent time off having their home on the market for a while and money because they have to continue paying that mortgage. If this can be avoided it will save everyone time, money and all the crazy emotions one goes through. You also want to speak with your attorney and seek advice from him/her on what items at hand you should ask to be repaired. I recently went on a trip to Miami. I was amazed at the new construction going on in South Beach….